In this series, which reveals yet another never-before-revealed secret origin for Badger, Daisy Fields is an ambitious young therapist whos just been assigned to Norbert Sykes, also known as Max Swell, Emily, Pierre, Gastineau, and... Badger! A world-class martial artist, a post-traumatic syndrome-suffering Vietnam vet, and full-blown multiple personality, Badger is the strangest and most dangerous case Daisy will ever take. If this werent enough, Daisys got to deal her drug-dealing boyfriend and a mysterious campus menace known only as The Phantom!<br />This four-issue limited series expands upon the events of Capital Comics The Badger #1 - Precipitation. 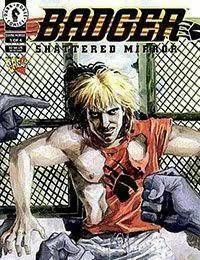 The premiere issue of this Dark Horse series coincided with the first issue of Badger: The Zen Pop Funny-Animal series, which examined Badger and his cast of characters through a different lens.